Inspired by Barbour's rich heritage in motorcycle clothing, the Ladies' International reworks the iconic biker-style jacket for a feminine silhouette. 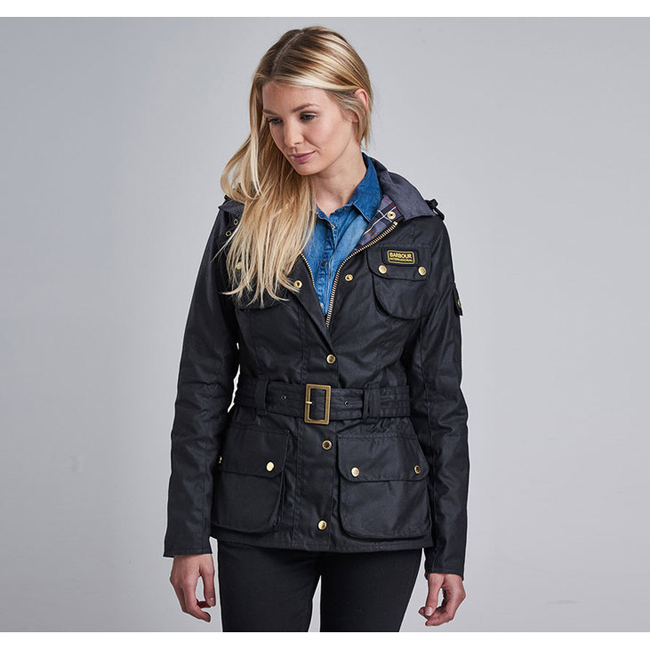 Part of the Tourer collection by Barbour International, this fitted and flattering waxed jacket features an adjustable belt with a large brass buckle to cinch in the waist, creating a tailored, feminine shape. Authentic biker jacket details – including shoulder epaulettes, collar strap, sleeve pocket and zipped cuffs – add a moto-inspired edge, and the signature Modern Tartan print adorns the 100% cotton lining, celebrating Barbour's Scottish heritage with a contemporary twist. In classic Black, the heavyweight 8oz Sylkoil waxed cotton outer gives protection against the elements with a traditional matte finish, while the sturdy zip, stud fastenings and sumptuous cord-lined collar help keep winter chills at bay. The famous black and yellow International logo is emblazoned on the chest pocket flap, adding unmistakeable authenticity. Nice and light. I bought the small size for camping. The mid section is big - out of proportion with the rest of the fit. But its perfect for warming up after tubing or while sitting in front of the fire in the early morning before the sun comes up in the Midwest. Not a winter coat. Fits a little snug, but I love it. I wear it almost everyday! Super comfortable and great for casual days. What a great find when you can be comfortable with a soft and warm fleece jacket. My sister-in-law loves her Christmas jacket! Thanks Amazon!!! I just love this rain jacket. I ordered a small and it fits me perfectly. I normally wear small and extra small. It is tapered to fit so if you are in between sizes you should probably order a size up. It does the job for keeping you dry even in a down pour. I also washed it as directed and it came out just fine. Would highly recommend.